With the “Claw” cable runner, SKYLOTEC provides a unique solution for permanently installed climbing protection systems, allowing employees to have safe access when working at heights or in lower-lying areas. The cable runner boasts features that enable simplified application and reduce the risk of an accident. Whether in wind turbines, on buildings, masts or in manholes - for maintenance or servicing work employees often use permanently installed climbing protection systems. On these systems they use what is known as a guided fall arrester that is worn on the body as part of the Personal Fall Protection Equipment (PFPE) and when climbing connects the fitted body harness with the fixed installed climbing protection system that is not part of the PPE. With the “Claw”, SKYLOTEC now provides a runner for vertical access on cables with a diameter of 8 mm. Here, the runner may also be used with existing systems from other manufacturers under certain circumstances. This has a major advantage to companies concerning the question if and how existing systems can continue to be used or enhanced with a safer state-of-the-art runner. During development of the “Claw” the fall-arrest system experts at SKYLOTEC focused in particular on easy operation and minimising the risk of incorrect use. The cause of an accident in the workplace is often not equipment failure but much more likely incorrect use by the individuals concerned. Also when using fall arrest runners there have been accidents in the past which were often the result of misuse. SKYLOTEC’s new product is a response to this. When it comes to users’ safety, the “Claw” boasts many clever details. For instance, the runner is secured directly in a number of ways to prevent incorrect use in error. The fall arrester cannot, for example, be attached to the cable if it is held the wrong way round by the user. An integrated locking mechanism prevents this from happening and a skull symbol also clearly indicates the application error. In order to prevent unintended or ill-considered removal the cable runner may only be removed from the cable if the user actively releases a locking mechanism, loosening the runner in the process. 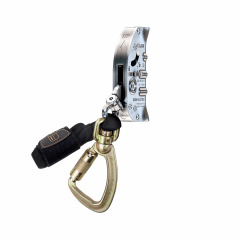 If the climber slips or falls, the carabiner pivots downwards in a flash and the “Claw” blocks immediately. The built-in shock absorber pack reduces the impact force, and thus the forces exerted on the human body, far below the 6 kN permitted. The cable runner is certified in accordance with EN 353-1:2014 as guided type fall arresters including a rigid anchor line. It secures a maximum of one person weighing from 50 kg to 150 kg.